A proven nonsurgical procedure that stimulates the body's natural healing processes to strengthen joints weakened by trauma or arthritis. Arch Phys Med Rehabil. 2005 Apr;86(4):697-702. Efficacy of dextrose prolotherapy in elite male kicking-sport athletes with chronic groin pain. Topol GA, Reeves KD, Hassanein KM., Physical Medicine and Rehabilitation Service, Jaime Slullitel Rosario Orthopedic and Trauma Institute, Argentina. OBJECTIVE: To determine the efficacy of simple dextrose prolotherapy in elite kicking-sport athletes with chronic groin pain from osteitis pubis and/or adductor tendinopathy. SETTING: Orthopedic and trauma institute in Argentina. PARTICIPANTS: Twenty-two rugby and 2 soccer players with chronic groin pain that prevented full sports participation and who were nonresponsive both to therapy and to a graded reintroduction into sports activity. INTERVENTION: Monthly injection of 12.5% dextrose and 0.5% lidocaine into the thigh adductor origins, suprapubic abdominal insertions, and symphysis pubis, depending on palpation tenderness. Injections were given until complete resolution of pain or lack of improvement for 2 consecutive treatments. MAIN OUTCOME MEASURES: Visual analog scale (VAS) for pain with sports and the Nirschl Pain Phase Scale (NPPS), a measure of functional impairment from pain. RESULTS: The final data collection point was 6 to 32 months after treatment (mean, 17 mo). A mean of 2.8 treatments were given. The mean reduction in pain during sports, as measured by the VAS, improved from 6.3+/-1.4 to 1.0+/-2.4 ( P <.001), and the mean reduction in NPPS score improved from 5.3+/-0.7 to 0.8+/-1.9 ( P <.001). Twenty of 24 patients had no pain and 22 of 24 were unrestricted with sports at final data collection. DESIGN: Sixty-one patients, representing 94 hips who had been in pain an average of 63 months, were treated quarterly with Hackett-Hemwall dextrose Prolotherapy. This included a subset of 20 patients who were told by their medical doctor(s) that there were no other treatment options for their pain and a subset of eight patients who were told by their doctor(s) that surgery was their only option. Patients were contacted an average of 19 months following their last Prolotherapy session and asked questions regarding their levels of pain, physical and psychological symptoms and activities of daily living, before and after their last Prolotherapy treatment. 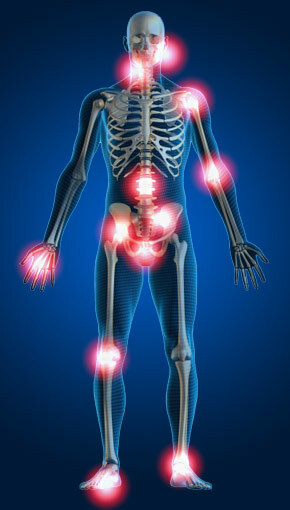 RESULTS: In these 94 hips, pain levels decreased from 7.0 to 2.4 after Prolotherapy; 89% experienced more than 50% of pain relief with Prolotherapy; more than 84% showed improvements in walking and exercise ability, anxiety, depression and overall disability; 54% were able to completely stop taking pain medications. The decrease in pain reached statistical significance at the p<.0001 for the 94 hips, including the subset of patients who were told there was no other treatment options for their pain and those who were told surgery was their only treatment option. Topol GA, Reeves KD: Regenerative injection of elite athletes with career-altering chronic groin pain who fail conservative treatment: a consecutive case series. Am J Phys Med Rehabil 2008;87;. Design: Consecutive enrollment of elite performance-limited athletes with chronic groin/abdominal pain who failed a conservative treatment trial and whose careers were threatened. The treatment consisted of monthly injections of 12.5% dextrose in 0.5% lidocaine in abdominal and adductor attachments on the pubis. Injection of the nociceptive source was confirmed by repetition of resistive testing 5 mins after injection. Results: Seventy-five athletes were enrolled. Seventy-two athletes (39 rugby, 29 soccer, and 4 other) completed the minimum two-treatment protocol. Their data revealed a mean groin pain history of 11 (3–60) mos. Average number of treatments received was 3 (1–6). Individual paired t tests for Visual Analog Scale (VAS) of pain with sport (VAS Pain) and Nirschl pain phase scale measured at 0 and an average of 26 (6–73) mos indicated VAS Pain improvement of 82% (P <10 10 ). and Nirschl pain phase scale improvement of 78% (P <10 10 ). Six athletes did not improve following regenerative injection therapy treatment, and the remaining 66 returned to unrestricted sport. Return to unrestricted sport occurred in an average of 3 (1–5) months.